So last week I went a bit AWOL and whilst I did update in part I didn’t actually share the main reason for my absence. I was actually in the middle of buying a house! It should be explained that I’m not moving and it’s not a holiday home. It is in fact Taid’s house. 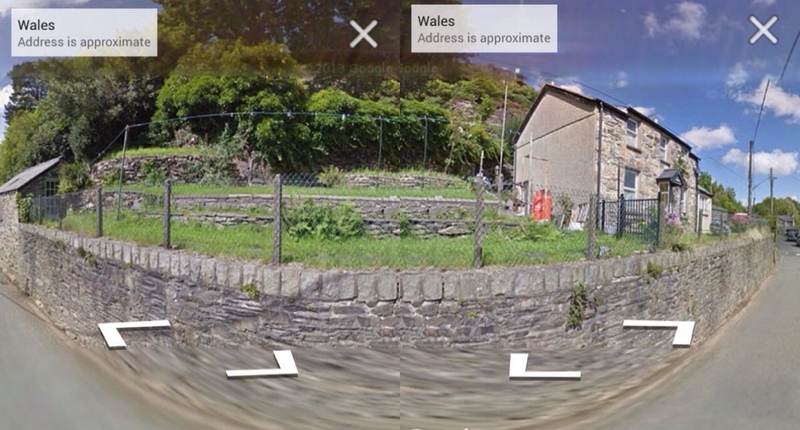 This photo is made up of two screen caps from Google Maps – the house isn’t on a curve really. The house was left to Dad and his sister in Taid’s will. Dad decided he was too old to do the house up and his sister wanted to sell it. So I said I would like to buy it. I managed to get a buy to let mortgage and last week all the paperwork went through and now we own it! My Mam needs somewhere to live so she’s going to live in the house. The house desperately needs a new bathroom before she can move in. The house needs to be gutted out really but Mam is happy to live there as it is. Trouble is, Dad doesn’t know that Mam is going to live there. I don’t think he’d be too pleased if he found out! I don’t think Taid would mind because he liked Mam – in fact when Dad got married Taid made a list of who he wanted to invite and Mam was at the top of the list! I do need a tenant to cover the mortgage payment and who better than my Mam. If she moves in then at least I can always visit the house again. It would have broken my heart if it had been sold to a stranger! So now we are looking into bathrooms and kitchens etc…. Exciting stuff! I can’t wait to see what you do with the bathroom! Thank you! Thankfully I’m not going to live in the house so I won’t have to move! I’ve already moved twice in the past five years. My Mam’s going to move in after we’ve done the bathroom. I will be taking before and after photos! Ha it goes to show that I shouldn’t read blog posts when I’m not feeling well!! My apologies! Your Mam is so fortunate to have you do all that work for her. I can’t wait to see before/after pictures!! Lol not to worry! Hope you feel better soon!